We’re living in the “Age of Aluminum” according to Chris Exley, PhD of England. Do you associate aluminum exposure with Alzheimer’s disease? Despite the correlation between the neurotoxin and brain disease over the decades, a definite cause hadn’t been clinically presented. Perhaps you’ve heard of the intriguing work of Professor Chris Exley who found that drinking certain mineral waters each day is the prime method of easily and safely removing aluminum from the body. Is Aluminium Involved in Alzheimer’s Disease and Can Silicon-Rich Mineral Waters Protect Against Aluminium’s Involvement in the Disease? When we last spoke to Dr. Exley, he had already tested silicon-rich waters like Volvic mineral water on human test subjects to discover that some of them had regained their cognitive abilities. Mineral water that contains high amounts of naturally occurring silica will draw aluminum safely out of the body. At the time we spoke last year, he was raising funds to truly test the aluminum Alzheimer’s link. This previous lack of clinical trial led to dismissal and derision from corporations and the part of the scientific community that perhaps received their funds from corporations. As you might imagine, corporations weren’t exactly chomping at the bit to fund Exley’s quest to prove the link. We believe Exley’s newest work will provide hope and excitement to our readers. Be sure to listen to our interview after the press release. There has been a strong link between human exposure to aluminium and the incidence of Alzheimer’s disease for half a century or more. However, without definite proof, there is still no consensus in the scientific community about the role of this known neurotoxin in this devastating brain disease. The latest research from my group, published in the Journal of Trace Elements in Medicine and Biology, makes this link even more compelling. In my view, the findings are unequivocal in their confirmation of a role for aluminium in some if not all Alzheimer’s disease. At the very least, these new results should encourage everyone and even those who have steadfastly maintained that aluminium has no role in the disease to think again. I don’t believe that is the only factor, but I think it is an important one which should be considered very seriously. When our new results are put into the context of what is already known about aluminium and Alzheimer’s disease their significance becomes overwhelming and compelling. We already know that the aluminium content of brain tissue in late-onset or sporadic Alzheimer’s disease is significantly higher than is found in age-matched controls. So, individuals who develop Alzheimer’s disease in their late sixties and older also accumulate more aluminium in their brain tissue than individuals of the same age without the disease. Even higher levels of aluminium have been found in the brains of individuals, diagnosed with an early-onset form of sporadic (usually late onset) Alzheimer’s disease, who have experienced an unusually high exposure to aluminium through the environment (e.g. Camelford) or through their workplace. This means that Alzheimer’s disease has a much earlier age of onset, for example, fifties or early sixties, in individuals who have been exposed to unusually high levels of aluminium in their everyday lives. We now show that some of the highest levels of aluminium ever measured in human brain tissue are found in individuals who have died with a diagnosis of familial Alzheimer’s disease. The levels of aluminium in brain tissue from individuals with familial Alzheimer’s disease are similar to those recorded in individuals who died of an aluminium-induced encephalopathy while undergoing renal dialysis. Posted in MENTAL HEALTH. Tagged althzeimers disease. Of the mice that received the treatment, 75 percent got their memories back. Australian researchers have come up with a non-invasive ultrasound technology that clears the brain of neurotoxic amyloid plaques – structures that are responsible for memory loss and a decline in cognitive function in Alzheimer’s patients. If a person has Alzheimer’s disease, it’s usually the result of a build-up of two types of lesions – amyloid plaques, and neurofibrillary tangles. Amyloid plaques sit between the neurons and end up as dense clusters of beta-amyloid molecules, a sticky type of protein that clumps together and forms plaques. Neurofibrillary tangles are found inside the neurons of the brain, and they’re caused by defective tau proteins that clump up into a thick, insoluble mass. This causes tiny filaments called microtubules to get all twisted, which disrupts the transportation of essential materials such as nutrients and organelles along them, just like when you twist up the vacuum cleaner tube. As we don’t have any kind of vaccine or preventative measure for Alzheimer’s – a disease that affects 343,000 people in Australia, and 50 million worldwide – it’s been a race to figure out how best to treat it, starting with how to clear the build-up of defective beta-amyloid and tau proteins from a patient’s brain. Now a team from the Queensland Brain Institute (QBI) at the University of Queensland have come up with a pretty promising solution for removing the former. Publishing in Science Translational Medicine, the team describes the technique as using a particular type of ultrasound called a focused therapeutic ultrasound, which non-invasively beams sound waves into the brain tissue. By oscillating super-fast, these sound waves are able to gently open up the blood-brain barrier, which is a layer that protects the brain against bacteria, and stimulate the brain’s microglial cells to activate. Microglila cells are basically waste-removal cells, so they’re able to clear out the toxic beta-amyloid clumps that are responsible for the worst symptoms of Alzheimer’s. The team reports fully restoring the memories of 75 percent of the mice they tested it on, with zero damage to the surrounding brain tissue. They found that the treated mice displayed improved performance in three memory tasks – a maze, a test to get them to recognise new objects, and one to get them to remember the places they should avoid. The team says they’re planning on starting trials with higher animal models, such as sheep, and hope to get their human trials underway in 2017. You can hear an ABC radio interview with the team here. Posted in MENTAL HEALTH. Tagged Alzheimer’s treatment. To learn more about the dangers of fluoride and the science behind why it is harmful and anything but beneficial for teeth, be sure to visit the Fluoride Action Network’s website. Posted in MENTAL HEALTH. Tagged sodium flouride. Watching too much television can change the structure of a child’s brain in a damaging way, according to a new study. Researchers found that the more time a child spent viewing TV, the more profound the brain alterations appeared to be. MRI brain scans showed children who spent the most hours in front of the box had greater amounts of grey matter in regions around the frontopolar cortex – the area at the front of the frontal lobe. But this increased volume was a negative thing as it was linked with lower verbal intelligence, said the authors, from Tohoku University in the city of Sendai. They suggested grey matter could be compared to body weight and said these brain areas need to be pruned during childhood in order to operate efficiently. Posted in MENTAL HEALTH, technology. Tagged childs brain function, television effects brain. You comfort them over a skinned knee in the playground, and coax them to sleep with a soothing lullaby. But being a nurturing mother is not just about emotional care – it pays dividends by determining the size of your child’s brain, scientists say. Both of these images are brain scans of a two three-year-old children, but the brain on the left is considerably larger, has fewer spots and less dark areas, compared to the one on the right. According to neurologists this sizeable difference has one primary cause – the way each child was treated by their mothers. 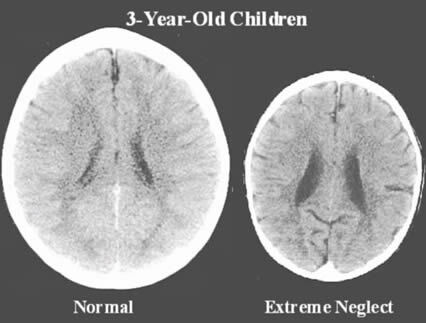 But the child with the shrunken brain was the victim of severe neglect and abuse. Babies’ brains grow and develop as they interact with their environment and learn how to function within it. When babies’ cries bring food or comfort, they are strengthening the neuronal pathways that help them learn how to get their needs met, both physically and emotionally. But babies who do not get responses to their cries, and babies whose cries are met with abuse, learn different lessons. The neuronal pathways that are developed and strengthened under negative conditions prepare children to cope in that negative environment, and their ability to respond to nurturing and kindness may be impaired. According to research reported by the newspaper, the brain on the right in the image above worryingly lacks some of the most fundamental areas present in the image on the left. The consequences of these deficits are pronounced – the child on the left with the larger brain will be more intelligent and more likely to develop the social ability to empathise with others. This type of severe, global neglect can have devastating consequences. The extreme lack of stimulationmay result in fewer neuronal pathways available for learning. The lack of opportunity to form an attachment with a nurturing caregiver during infancy may mean that some of these children will always have difficulties forming meaningful relationships with others. But studies have also found that time played a factor–children who were adopted as young infants have shown more recovery than children who were adopted as toddlers. But in contrast, the child with the shrunken brain will be more likely to become addicted to drugs and involved in violent crimes, much more likely to be unemployed and to be dependent on state benefits. The child is also more likely to develop mental and other serious health problems. Professor Allan Schore, of UCLA, told The Sunday Telegraph that if a baby is not treated properly in the first two years of life, it can have a fundamental impact on development. He pointed out that the genes for several aspects of brain function, including intelligence, cannot function. And sadly there is a chance they may never develop and come into existence. These has concerning implications for neglected children that are taken into care past the age of two. It also seems that the more severe the mother’s neglect, the more pronounced the damage can be. The images also have worrying consequences for the childhood neglect cycle – often parents who, because their parents neglected them, do not have fully developed brains, neglect their own children in a similar way. But research in the U.S. has shown the cycle can be successfully broken if early intervention is staged and families are supported. The study correlates with research released earlier this year that found that children who are given love and affection from their mothers early in life are smarter with a better ability to learn. The experiences of infancy and early childhood provide the organizing framework for the expression of children’s intelligence, emotions, and personalities. When those experiences are primarily negative, children may develop emotional, behavioral, and learning problems that persist throughout their lifetime, especially in the absence of targeted interventions. The study by child psychiatrists and neuroscientists at Washington University School of Medicine in St. Louis, found school-aged children whose mothers nurtured them early in life have brains with a larger hippocampus, a key structure important to learning, memory and response to stress. The research was the first to show that changes in this critical region of children’s brain anatomy are linked to a mother’s nurturing, Neurosciencenews.com reports. The research is published online in the Proceedings of the National Academy of Sciences Early Edition. Lead author Joan L. Luby, MD, professor of child psychiatry, said the study reinforces how important nurturing parents are to a child’s development. Posted in MENTAL HEALTH. Tagged child mental health. The brain is a very adaptable organ. It has the cognitive ability to adapt to stress, whether real or imagined, but do violent video games and movies actually help us to adapt to a sadistic world, or help to create one? Gamers and researchers have been on both sides of this argument, but with all the advances in brain imaging and the new studies in neuroplasticity, it seems hard to deny that old axiom that what goes in must come out. Part of the problem is that our brains are so adaptable, and a relatively new study coming out of the University of Missouri (U of M) shows that violent video games appear to make people more aggressive and desensitized to the violence that we see in our every day world. While this finding seems obvious, it is still relatively groundbreaking in science to understand that the relationship between our mind and our subjective experience actually has physical effects on our body and brain, effects that are dramatic and can even be enduring. 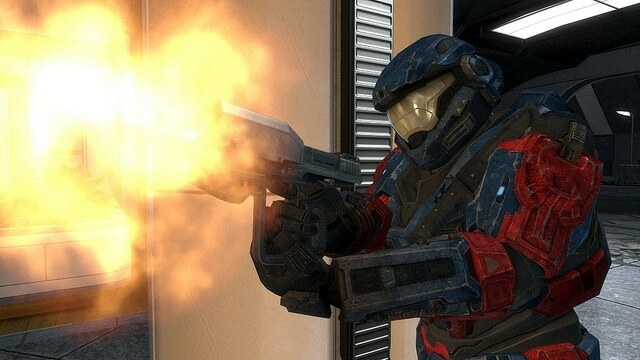 If you’ve ever played ‘Halo,’ (which consequently raked in over $300 million in sales in the first two weeks of its release), ‘Call of Duty,’ or ‘Grand Theft Auto’ the last of which you can actually slap a grandmother and steal her purse, then you have likely desensitized your brain to real life acts of aggression and violence. The longer you sit before violent images and the more frequently you play, apparently the more desensitized you get. With findings like these, it is no wonder that young adults growing up in a world of progressive violence and disregard for their peers and community seems like just another average day. According to the U of M study, even people who don’t normally play video games were still affected by playing violent games. While video games may teach our children to have better hand-eye coordination, or even improve their detail-oriented vision, they certainly don’t teach many valuable lessons, especially not the most popular games played by children and young adults today. 90% of children play video games today, and even though the average age of a gamer is 33, they still are affecting the collective brain of society. After one month’s release of ‘Black Ops’, it had been played for 600 million hours worldwide. In half as many hours the planet could be trilingual. Where are the video games about meeting moral challenges, learning a new language, planting fields of healthy food with age-old organic methods, or even teaching the brain how to transcend itself with meditative calm? In 2013 ‘Grand Theft Auto’ was named a top seller. In it people run around a corrupt city stealing cars and conducting heists. Another popular game is called ‘The Last of Us’ and in this video game, infected human beings following a pandemic which takes place on the planet earth, run around killing each and harming one another for food. It is clear that video games are here to stay. They are far too popular to eradicate completely, but since the video games being churned out by most companies these days tend to nullify our natural orientation towards compassion, lessen our sympathetic response to our fellow human beings, and reduce or ability to reduce conflict or respond positively to violence which already exists in the world, why don’t we harness the power of this medium and utilize it for good, instead of perpetuating vicious acts and cruel intentions? We could teach a whole new generation how to do higher sciences and math, come up with alternative forms of sustainable energy, plan new societies that benefit everyone involved, much like Buckminster Fuller did, or even learn to speak a dying language that holds secrets to healing cancer, diabetes and heart disease. Most importantly, we could teach a generation to not see war, crime and violence as ‘normal.’ We know that our brains do respond to the networks we create with repeated use of a specific cognitive pathway, or as Canadian psychologist Donald Hebb put it, neurons that fire together wire together. It’s time to create some different neuronal pathways than those provided by modern violent video game entertainment. Posted in MENTAL HEALTH. Tagged violent video games. What if you went to a crime ridden street corner, suffering from depression, and were told that a certain drug could change how you felt about things? What if you went to your doctor and were told the same thing? While the corner drug dealer and your physician might have different drugs in mind, they are essentially offering a similar solution—putting you in a “drug-induced” state to minimize your negative symptoms. Doctors, the media, and society say there chemical imbalance which causes depression, but a depression chemical imbalancedoesn’t exist. Dr. Joanna Moncrieff, a mental health expert from the department of mental health services at University College in London is taking a quite non-politically-correct approach in characterizing anti-depressants and other mental health drugs as just another dependency. She says that although doctors, the media, and society in general has latched on to the idea that depression and anxiety, for example, are just evidence of a “chemical imbalance” in the brain, there is no hard evidence to support this. She says that these drugs, like anti-depressants, often produce symptoms of other, illegal drugs. The difference—these are prescribed by medical professionals and marketed to the masses in a more acceptable way. In decades past, there was a stigma associated with mental health drugs. While it’s debatable whether this stigma was justified, there’s little doubt that it did make people think twice about taking medication for depression. Now, however, we are convinced that these drugs are correcting a defect in the brain. The drugs are correcting an “imbalance.” But the problem is, that imbalance has never been proven. Sure, you can argue that your medication makes you feel better, but wouldn’t other psychoactive drugs make you feel better too? Dr. Moncrieff isn’t suggesting that people take cheaper illegal drugs, since they may have similar effects, but instead wants people to really get real about their anti-depression or anti-anxiety medications– what are they really doing to themselves when they rise each morning and pop the same pill, occasionally having to up their dosage because their body has developed a tolerance. And with the number of Americans on antidepressant medication estimated to be 1 in 10, perhaps a critical look at this drug trade is warranted. Did you know that we can change our biology simply by what we believe to be true? The placebo effect is defined as the measurable, observable, or felt improvement in health or behaviour not attributable to a medication or invasive treatment that has been administered. It suggests that one can treat various ailments by using the mind to heal. For example, if two people have a head ache and one takes tylenol while the other is given a pill that contains nothing (sugar), both could report that the pill was successful and the headache is gone. The difference is, the one that was given the pill which contained nothing still believed that they were given a tylenol that would alleviate their headache. In doing so, their headache was cured because of what they believed to be true. This has happened on numerous occasions, many studies have shown that the placebo effect is real and highly effective. The placebo practice is known, but widely dismissed in medicine. The placebo effect should be a major topic of study in medical schools. Unfortunately drug companies study patients who respond to the placebo effect with the goal of eliminating them from early clinical trials. It bothers pharmaceutical manufacturers that in most of their clinical trials the placebos prove to be just as effective as their chemical ridden drugs. Examining the placebo effect would give rise to a whole new category under science, which would probably be consciousness. This is why it’s not examined thoroughly, the power of our perception and its ability to create our reality and even change our biology would open the door to a multitude of other questions, possibilities and potentialities for the human race. These potentialities would most likely wipe out many industries on the planet, from health all the way down to energy. These concepts are also heavily examined and illustrated by quantum physics. Another great example of the placebo effect came from the United States Department of Health and Human Services in 1999. The report discovered that half of severely depressed patients taking drugs improve compared to the thirty-two percent taking a placebo. Don’t forget about all of the side effects and dangers that have been associated with antidepressants every year. Don’t forget that the ‘depression industry’ alone is a multi billion dollar one(3). A 2002 article published in the American Psychological Association’s prevention & treatment, by University of Connecticut psychology professor Irving Kirsch titled, “The Emperor’s New Drugs,” made some more shocking discoveries(5)(4). He found that 80 perecent of the effect of antidepressants, as measured in clinical trials, could be attributed to the placebo effect. This professor even had to file a Freedom of Information Act (FOIA) request to get information on the clinical trials of the top antidepressants. It means that through the power of belief, your biological body can react in a necessary way to target whatever ailment you are experiencing. Thoughts, feelings, and emotions are directly responsible for changing your biology. If we look at depression for example, we are told the main cause of it is a chemical deficit in the brain. But if thoughts, feelings and emotions can release different chemicals in the brain, why not just work on the patients feelings to induce a different chemical state? If our feelings, emotions and thoughts are directly correlated with our biology, why aren’t we putting more resources into this research? Why is this not practiced by the medical industry? Why do we completely turn a blind eye to it? The human race has been trained, and programmed to believe that external medicines are necessary for all ailments. I’m not saying that some medical applications are not valid, I’m just saying the human race completely ignores the power of non-physical phenomenon. We continue to believe that we need something outside of ourselves to heal, when everything points to the fact that this is not entirely true. Our own biological system and the human being is very capable of healing itself. We just don’t know how, we don’t believe it, we are not exposed to it. Changing your biology with belief is not an easy process, because most of us don’t truly believe we can. We are going up against years of perceptual manipulation that have formed our thoughts and beliefs. Your beliefs shape your perception, and your perception is what creates real phenomenon. If you change the way you perceive things, the things you perceive change. We are powerful beings, and have abilities that have yet to be unlocked. I believe that these types of realities will continue to emerge and will be implemented in the future. The placebo effect demonstrates, from a biological standpoint, that what you believe indeed becomes your reality. For one to be able to use this, they must believe it. One must perceive it as real as the perceive their own hand real, the sun real, the stars real. It’s not about believing, it’s about knowing. The true nature of reality has yet to be discovered, but we continue to progress in our understanding. As we progress we realize how obsolete our current way of functioning really is. It’s time to evolve past our archaic ideas and false beliefs, and step into a new understanding of reality. We are capable of so much more, or potential is limitless. Posted in holistic healing, MENTAL HEALTH. 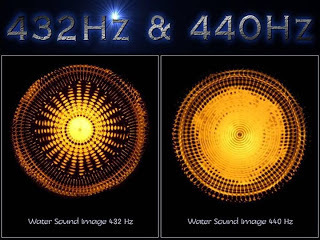 440hz Music – Conspiracy To Detune Us From Natural 432Hz Harmonics? Most music worldwide has been tuned to 440 hertz since the International Standards Organization (ISO) endorsed it in 1953. The recent rediscoveries of the vibratory / oscillatory nature of the universe indicate that this contemporary international concert pitch standard may generate an unhealthy effect or anti-social behavior in the consciousness of human beings. A=432 Hz, known as Verdi’s ‘A’ is an alternative tuning that is mathematically consistent with the universe. Music based on 432 Hz transmits beneficial healing energy, because it is a pure tone of math fundamental to nature. There is a theory that the change from 432 Hz to 440 Hz was dictated by Nazi propaganda minister, Joseph Goebbels. He used it to make people think and feel a certain manner, and to make them a prisoner of a certain consciousness. Then around 1940 the United States introduced 440 Hz worldwide, and finally in 1953 it became the ISO 16-standard. 440 Hz is the unnatural standard tuning frequency, removed from the symmetry of sacred vibrations and overtones that has declared war on the subconscious mind of Western Man. You just have to go out in the street and take a look around. What do you see? School kids, young adults on their way to work, a woman pushing her baby in a pram, a man walking his dog – and what do they all have in common? iPods or MP3 Players! Ingenious, isn’t it? Frequency and vibration hold a critically important yet hidden power to affect our lives, our health, our society and our world. The science of Cymatics (meaning the study of visible sound and vibration) proves that frequency and vibration are the master keys and organizational foundation for the creation of all matter and life on this planet. When sound waves move through a physical medium (sand, air, water, etc.) the frequency of the waves has a direct effect upon the structures which are created by the sound waves as they pass through that particular medium. Music has a hidden power to affect our minds, our bodies, our thoughts, and our society. When that music is based upon a tuning standard purposely removed from the natural harmonics found in nature, the end result may be the psychic poisoning of the mass mind of humanity. As Kymatica Documentary (2009) says: The rediscovered knowledge of the science of sound shows that sound is something more than mere vibratory signals, not only does sound interact with life but it sustains and develops it. It acts as a conduit of conscious intent between people, societies and entire civilizations. Posted in holistic healing, MENTAL HEALTH. Tagged frequencies. Go ahead: pack up a healthy lunch and step into the sun. Your brain will thank you for it. A study conducted by the University of Manchester proposes that adequate levels of vitamin D—which abounds in direct sunlight—helps maintain mind health and cognitive function. Researchers examined over 3,000 European men between the ages 40 and 79 and found that those with high levels of the vitamin outperformed with low levels in memory and information processing trials. Dr. Iain Lange, who conducted similar research, warns that poor diet in general—not necessarily vitamin D deficiency—could be to blame for poor mental performance. Even so, he admits that the evidence for vitamin D is rising and that it may safeguard cells or signaling pathways in the brain. Vitamin D deficiency is linked with rickets in children, weak bones in the elderly, poor mind health, heart disease, diabetes, and even cancer. A 2010 blog post in the Scientific American even adds to the ever extending list Parkinson’s disease, a neurological disorder associated with cognitive decline. Many studies in recent years (using genetically modified mice, although who knows how they’ve been “modified”) report that the animals experienced premature aging—retarded growth, osteoporosis, atherosclerosis, immunological deficiency, skin and organ atrophy, and short lifespan—due to low levels of vitamin D.
Despite the mounting evidence, researchers are quiet about why vitamin D is linked with mind health and improved cognitive health – it’s because they simply don’t know. Some say that vitamin D may trigger a boost in protective hormonal activity in the brain, although only animal and no human studies can back up this theory. Others claim that vitamin D reins in a hyperactive immune system. Still others cite the vitamin’s ability to boost antioxidant levels and detoxify the brain. And what better way to celebrate our evolutionary history than to step out into the great outdoors? If you need more reasons to take that beach trip this year, check out our previous article on the amazing benefits of vitamin D. And for those days when you’re stuck inside (remember, vitamin D can’t penetrate window glass! 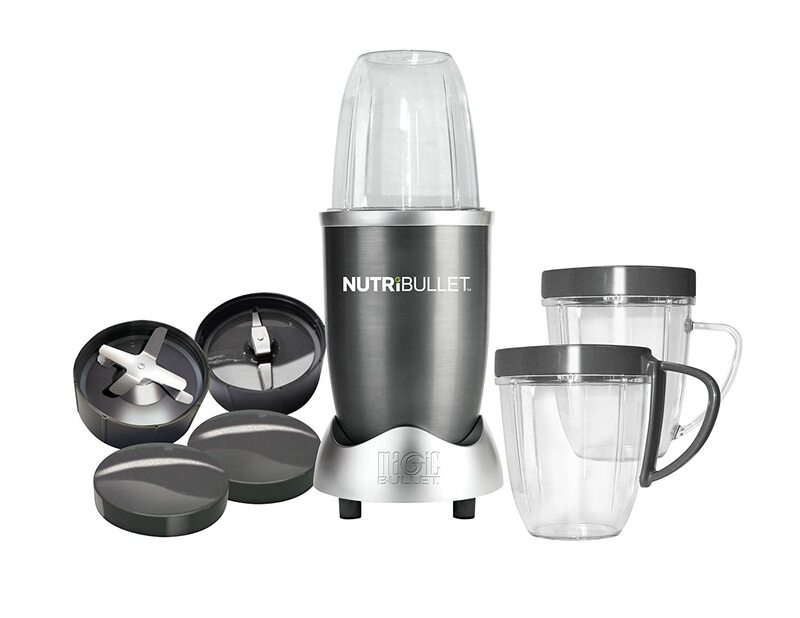 ), read up on other ways to get your fill of this essential nutrient. There are over five thousand species of mammals on planet Earth, but only one of them is insane. It also turns out there is only one species of mammal that intentionally poisons itself (and its children) by injecting toxic, neuro-damaging chemicals into most members of the species. That species is, of course, homo sapiens. 1) None of them eat processed foods. They innately eat raw, unprocessed, uncooked foods from nature. 2) None of them take prescription medications. 3) None of them inject their offspring with toxic vaccines laced with hidden chemicals. 4) None of them practice mechanized chemical agriculture / monoculture. 5) None of them live in delusional, artificial worlds of TV or the internet. Yet humans, the most insane species on the planet, routinely engage in all five of these things, poisoning their own bodies, minds and children with heavy metals, pesticides, mercury, vaccine adjuvants, mind-altering medications, chemical solvents, GMOs and delusional mind programming. What is the root cause of all this insanity? It’s POISON. Physical, chemical, biological poison. • Our food is intentionally laced with chemical poisons to make it look red (sodium nitrite), or taste savory (MSG), or last longer on the shelves (chemical preservatives). • Our medicines are laced with fluorine molecules to make them highly reactive to brain cells (SSRIs). • Our vaccines our formulated with trace levels of brain-damaging methyl mercury and chemical adjuvants to provoke an “inflammatory” response in the immune system which also happens to cause autism, seizures and brain damage. • Our lawns are sprayed with synthetic poisons that cause Alzheimer’s and depression. 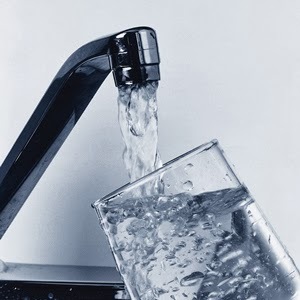 • Our water supply is used as a toxic waste dump to dispose of fluoride compound chemicals that would otherwise have to be handled as toxic waste. • The media teaches the public that nutrition is useless but that prescription medications are “essential nutrients” required for healthy living. • There is lead in cosmetics, cadmium in rice, arsenic in seaweed, mercury in vaccines and aluminum in almost everything. The human race is being heavily poisoned with heavy metals. The cumulative effect of metals poisoning, fluoride poisoning, pesticide poisoning, vaccine poisoning and food additive poisoning is biochemical brain damage. We are living in a society where 90% or more of the population is literally brain damaged beyond repair. This is why irrationality has gone wild everywhere you look. It’s why people keep buying the same poisons that have already poisoned them while turning to medications to mask the symptoms of that poisoning, thereby poisoning themselves even further with the meds. It’s why the No. 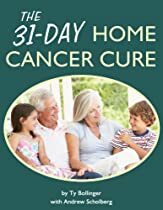 1 treatment for cancer is a chemical cocktail (“chemotherapy”) which causes, as its top side effect, more cancer. And it’s why a rapidly-expanding subset of the population is now utterly unable to read, to parse words, to speak in coherent sentences or even to engage in anything resembling rational discourse. The ramifications of this epidemic of brain damage are bewildering. For starters, the entire system of justice and democracy upon which our republic is based is contingent upon people being sane. The sacred concept of a “jury of your peers” depends on your peers being sane. The idea of voting for public office also requires sane voters in order to achieve sane outcomes, and the “free market” system of capitalism and consumer choice assumes that consumers make rational decisions to drive that market. But they don’t. Consumers are brain damaged, then brainwashed, dumbed-down and manipulated. Voters are deluded and intentionally confused. Juries are manipulated and misinformed. In every sector of society where a group of sane people was supposed to restore balance and reason, we now have insane people driving society even further into the ground. Never before in the history of the world has the toxic burden on human beings been so great (and tragic). Never before has the chasm between the sane and the insane become so wide (and so dangerous). We are living in an era where rationality is alien to the masses. As a very simple example, it matters nothing to the voters that Obama has violated virtually every single campaign promise he made in the elections, including labeling GMOs, closing Guantanamo Bay, reducing the federal budget deficit, protecting whistleblowers, improving government transparency, providing affordable government health care and protecting the Constitution. He has grossly violated each and every one of these promises, yet his supporters somehow continue to believe in him. Such a belief is utterly irrational. It is, in fact, insane. But it is no more insane than the beliefs of those who blindly supported the Bush administration, or the Clinton administration, or any administration for that matter. What blind supporters all have in common is that they are brain damaged and therefore unable to think rationally. The situation has become so perverse that anyone who exhibits even a trace of rationality is immediately and publicly despised. For example, those who see the impending economic collapse (such as Paul Craig Roberts and Gerald Celente) are widely ridiculed for understanding economics and finance. Those who see the rapid construction of the police state society taking place right now (like Alex Jones) are branded conspiracy theorists. Those who expose the dangers of GMOs or the criminality of the pharmaceutical industry (like myself) are branded “anti-science” because we aren’t tricked by the quack science dogma of the for-profit biotech industry. Only brain-damaged people are now considered “normal” because that’s what is publicly accepted. As a personal example of this, I have a younger distant relative who was a mathematical genius is grade school. He could multiply two 3-digit numbers in his head in mere seconds and was on track to becoming a math genius superstar. But as he entered middle school, he discovered that being smart made you unpopular. So he dumbed himself down and began to act stupid in order to fit in. He became very popular with the “in” crowd and abandoned his mathematical genius. To this day he has never resurrected his genius, yet he falls for the common delusion of today’s youth who all believe they will have “jobs waiting for me” when they get out of college. The truth is that this kid gave up his only real advantage and now faces a life of mediocrity and conformity. This is the problem: When the incidence of brain damage across society is so widespread that exhibiting intelligent behavior gets you shunned as an outcast, society is already in its final stage of collapse. You are watching it unfold. Adults who ran society in the 1950’s were raised on real foods in the 1920’s and 30’s. Those foods consisted, in large part, fresh home-grown garden foods. GMOs didn’t exist. Toxic vaccines were barely on the radar. Chemical food additives were rarely consumed and pharmaceuticals were considered medicines to be used exclusively on sick people, not the entire population. As a result, most people who lived in the 1950’s strived to be healthy and intelligent. Many were outright geniuses by today’s standards. The grade school mathematics taught in the 1950’s included subjects that, today, are college courses: algebra and basic geometry, for example. Ten-year-old kids in the 1950’s could read classic American novels. Today’s kids can barely read comic books. Engineers and scientists of the 1950’s were brilliant, healthy and hip. With nothing more than simple, mechanical slide rules, they could perform high-level mathematics that would make today’s college professors cower in awe. But today’s scientists are often just corporate hacks spewing fraudulent science on patented medications or GMO seeds. In the late 1940’s and throughout the 1950’s, Big Food cranked up its factories, churning out processed, nutrient depleted foods at a pace never before witnessed in the history of human civilization. So the kids of the 1960’s got raised on “imitation” foods — things that looked and tasted nutritious but lacked any real nourishment. By the 1970’s, they were all eating white bread and getting shot up with vaccines formulated with hidden cancer viruses like SV40. As the 1980’s rolled in, Americans who were raised on imitation foods became pathetic and lazy, and in the 1990’s they became delusional, falling for the dot-com boom which soon became a bust. By the early 2000’s, America had fully entered “brain damage” mode which was only exacerbated by the arrival of George W. Bush, the nation’s first truly brain-damaged president who had difficulty completing sentences or finishing thoughts, which is apparently what made him so popular with voters who shared the same cognitive disability. The children raised in the early 1990’s on prescription medications and junk foods are now society’s young voters. They are Obama supporters, and they’re heavily damaged with metals, pesticides, vaccines, GMOs and synthetic chemicals. This generation is wholly incapable of learning or grasping even basic concepts of mathematics, history, science or even language. Functionally illiterate and cognitively nullified, they are the new “zero-class workers” upon which the Obama economy is based. They have no skills, no reason and essentially no value to society other than simple manual labor skills which will soon be replaced by humanoid robots. Yet here in America, they still have a vote. That’s exactly why political campaigns will continue to pander to their ignorance, defying all rationality in the quest for proxy popular support from the great masses of the truly clueless. Rush Limbaugh calls these people “low-information” voters. But he’s only half right about that. They aren’t merely low information; they’re clinically brain damaged. Because you can throw all the information you want at them but none of it sticks. The brains no longer possess the neurology to store, process and retrieve meaningful information. In effect, they are no longer functioning members of a civilized society. Posted in FOOD HEALTH, GMO POISON, MENTAL HEALTH. All illness comes from lack of energy, and the greatest energy drainer is mental and emotional stress, which I believe to be the root cause of all illness. Stress is one of the major elements that can erode energy to such a large and permanent extent that the immune system loses all possibility of functioning at an optimum level. The Only Answer to Stress Anxiety & Depression is a book of hope, and Dr. Coldwell wants the reader to understand that there is always hope, no matter how bad Their health situation is right now. The journey to ultimate health can begin today!